Full disclosure: I live super close to Vino Vino, so when I have the hankering for delicious wine and some bites, I typically head just down the street to this adorable Hyde Park bistro. But, I also absolutely adore the reliable wine selection and how tasty everything always is. Most wine bars tend to be super stuffy or feel like a little old lady owns them. Vino Vino has gotten rid of all the bottles on the wall and classed up the joint with a couple of posh details, like cute chandeliers in the dining room. But, I often just cozy up to the bar, though, which is adorned with gorgeous lamps and is a little darker and sexier. The whole place is so much cleaner and sleeker than most mumsy wine bars but is homey rather than stuffy or pretentious. It definitely walks that fine line. Vino Vino recently got a brand new chef, so the menu has been recently revamped. They also just added a prix fixe menu for $40 for three courses, which I haven't partaken in yet, but is an absolute steal! Bonus: The wine list is downright impeccable without being overly pricey--sure you CAN ball out with a $98-bottle of wine, but most are in the $30-50 range. Their list by the glass changes regularly, so be on the lookout! 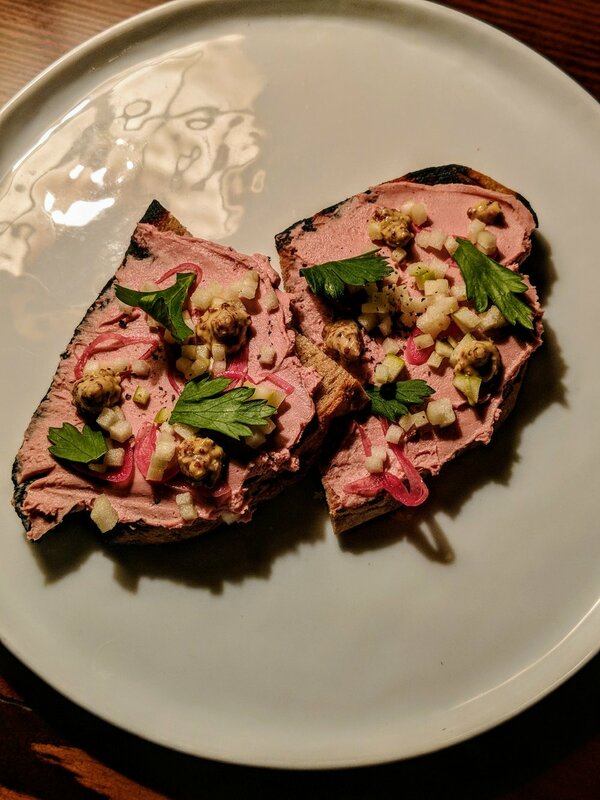 Personally, I love the happy hour, which runs later than most (5-7 p.m.) and is half off their snacks, which means that a gorgeous, silky chicken liver mousse on toast is only $3.50! Ditto their Hopi blue corn Johnny cakes. Like, seriously, Vino Vino? Both are super delicious. Grab the summer melon, too, before it goes off the menu. It's the perfect way to bid adieu to the hot weather. You can also grab a glass of wine for $2 off. As far as dinner goes, my two favorites are the mussels, which are extremely classic with white wine and cream--make sure to use that bread to sop up all that goodness!--and, of course, the burger. As you may recall, burgers are my fave, and this one is pretty dang good. 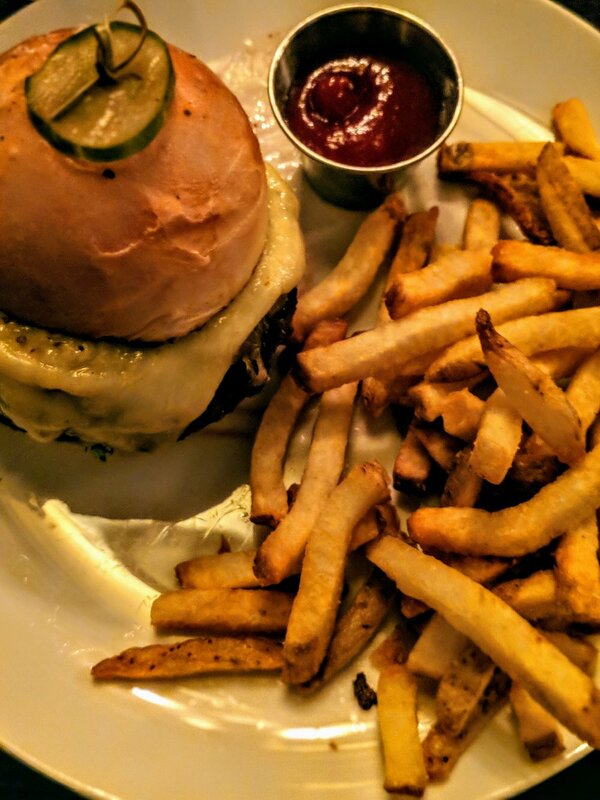 The patty comes cooked to order on a house-made bun and is topped with sharp cheddar, caramelized onions, and a tangy and rich dijonaise. The fries also perfectly match the burger's deliciousness. Thankfully, there's no shoestring here! So, if you're in the market for a beautiful meal--or even just a few bites--with delicious wine, head down Guadalupe until you see the muscle arm of Hyde Park Gym and then head next door to Vino Vino!